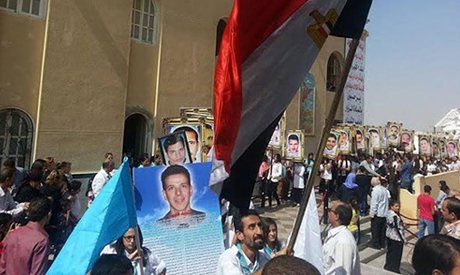 A memorial mass for 27 Christians killed in the 2011 Maspero clashes was held on Thursday at the Archangel Michael Church in 6 October city on the outskirts of Cairo, where the victims are buried. The mass commemorated the third anniversary of events in 2011 when 27 unarmed protesters were killed and more than 300 injured by security forces during a protest in central Cairo. Video footage of the events showed armoured vehicles driving over protesters who were marching to the Maspero state television and radio building to denounce discrimination against Christians. The church’s scout troupe performed a funeral march after the mass. Holding Egyptian flags, they circulated the church three times to the sounds of drums and ululating, before going down to the graves. A vigil was also held on Thursday in Cairo's Shoubra district where participants held candles and sang hymns, holding up images of the victims. In September 2012, three soldiers were charged with "involuntary manslaughter" in connection with the events and sentenced to two and three years in jail. The verdict was criticised by some rights activists as all investigations were led by the military itself. Over the past two years several Coptic rights and political groups have called for investigations into the incident to be reopened.